Penetrations in roof systems are common sources of water intrusion into attic spaces. Improper flashing, deteriorated rubber boot flashing, missing or improperly installed flashing around chimneys or other penetration points, and inadequate roof repairs are common causes of roof leaks. Also, water seepage occurs when the roof is beyond the end of its life span and failing. Water damage and mold growth is a common result of roof leaking conditions. Annual inspection of your roof by a roofing specialist and routine maintenance can prevent leaks in the roof system, reducing the likelihood of mold growth in your attic. The lack of proper roof ventilation is a conducive condition to mold growth in attics. Without adequate ventilation, moisture laden air remains in the attic area, often times causing elevated moisture conditions at the roof framing and roof sheathing. During cold winter months, condensation can occur on the cold roof sheathing, creating elevated moisture conditions. Another common cause of inadequate ventilation is when insulation is blown into the attic and care is not taken to prevent the insulation from blocking the soffit vents. Soffit vents are critical in a passive ventilation system in order to move the air from the lower portion of the attic (intake soffit vents) to the upper roof vents (exhaust vents). Adding additional ventilation ports or a powered roof vent can oftentimes improve and correct inadequate roof ventilation conditions. Exhaust fans should be vented directly to the exterior of the home. However, this often is not the case. When the exhaust fan is missing its exhaust duct or the duct has become separated, that exhaust air is vented directly into the attic space, oftentimes contributing to microbial growth. Attic insulation not only is important in energy conservation, but proper insulation levels can also reduce the chance of mold growth in attics. As air travels up through the structure, insulation provides a barrier to slow the rate of conditioned air loss into the attic area. When an attic has missing insulation, the air movement increases significantly and that warm air can cause condensation conditions on cold roof sheathing. The moisture conditions resulting from such condensation is a catalyst for mold growth. Check your insulation and make sure that you have good and even coverage throughout the entire attic, especially at the lower North side areas. Unsealed openings in ceilings, around exhaust fans, can lights, speakers, etc. allow warm conditioned air to escape into the attic area. Sealing all penetrations in the ceiling can be an important preventative step in reducing mold growth in attics. 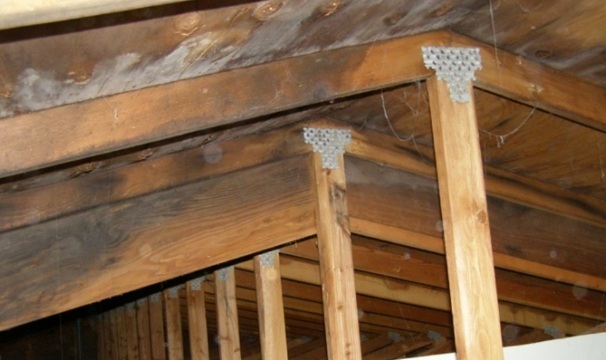 Finally, we frequently get asked, why is mold in an attic a big deal? While it is true that attic areas are not generally considered living spaces and air communication from upper attic areas to the living space below is relatively uncommon (in most normal situations), attic mold should still be a concern. Why? Because it is possible that if negative pressure conditions exist or occur in the home, air containing mold spores could potentially be drawn from that attic area into the living space. In addition, attic mold is usually an indication of other defects or conditions that could lead to costly repairs down the road, such as water damage, mold contamination in the finished living areas, wood destroying organisms and other moisture related conditions. Now go check your attic and if you see unusual staining or mold-like conditions, call a mold professional for a full assessment and appropriate testing.